I Have a Glee Hangover. This isn’t the post that I wanted to write. I wanted to write something spectacular and meaningful. At the very least, the elusive post should have been hilarious. It’s not mean to be today. Why? I’m suffering from a “Glee” hangover. I stayed up too late watching “Glee.” I could not stop watching. Darned you Netflix and your new episodes. No. Wait. I love Netflix and the new episodes. I wait for them all season long. So I can’t think about anything else except “Glee” and my friend, Lizzi. She’s coming to America! I might get to see her if she stops in Ohio. Glee is set in Ohio. . . . Anyway, I don’t think Lizzi will be doing a tour of “Glee” landmarks. Maybe we could just do showtunes at Karaoke and take a ridiculous number of pictures and post them on Instagram. Then I could have a real “Glee” hangover and an actual hangover. This is Lizzi’s blog. 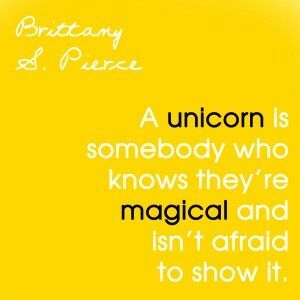 She is also a magical unicorn. P.S. I took a quiz. It said I’m Rachel. I feel like that’s not true. She’s way more organized and bossy. I see myself as a combination of Britney and Santana.